We carry a complete line of carvings made from antlers, fossil ivories, wood and bone. We offer one-of-a kind art pieces of animal, bird, fish and reptile carvings, baskets, and other hand crafted collectibles. We take pride in the quality workmanship of our custom carvings, baskets, beads, and special items. If you have any questions, comments or concerns before placing your order, please click here to contact us or call Ampac International on (509) 927 8923. American Pacific International searches the world diligently to find the best craftsmen and carvers and to create our handcrafted treasures. Read on to discover more about us, and why we are here for you. We carry a complete line of carvings made from antlers, fossil ivories, wood and bone. We offer one-of-a kind art pieces of animal, bird, fish and reptile carvings, baskets, and other hand crafted collectibles. If you need large or small amounts we can help, but please note that no two handmade items are exactly the same. We use all of natures products. 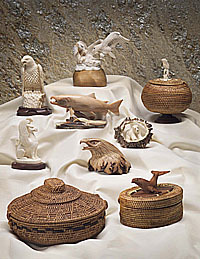 Ivory carvings are from fossil findings mainly from Northern Alaska. Walrus and Mammoth fossilized many millenia ago are used for most of our ivory carvings. Deer, elk, and moose sheds are used for our antler carvings. Our designer baskets are inspired by ancient primitive cultures, and are some of the highest quality in the world. They are hand-woven by local families with palm leaves, native grasses and bamboo grown in exotic villages on tropical islands around Indonesia. We also carry a large selection of Indonesian lampwork glass beads, as well as sterling silver Bali beads. We take pride in the quality workmanship of our custom carvings, baskets, beads, and special items. Ampac International is your source to the worlds finest collectibles - or as some call them, "Tomorrow's Treasures". Wholesalers of American Pacific International are profiting from our simple, effective business model. If you are a motivated business or individual who can meet (or create) a demand for unique carvings and other traditional handcrafts, fill out our Wholesaler Application today.